Every time we mentioned that we were going to Dublin, our friends would respond the same way: “Why Dublin?” The answer was simple, we wanted to go someplace we had never been before and Dublin sounded perfect. The hotel was stayed in was the Fritzwilliam and it was right in the center of town. I would highly recommend it because of the service and the pleasant rooms with a view of the park across the street or the garden in the back. When we arrived we went for breakfast at Bewley’s on Grafton Street. I skipped the Irish breakfast which typically includes eggs, sausages, bacon, beans, tomatoes, potatoes and other sides and had a delicious scone with butter and coffee. The bread in Ireland is wonderful as is the coffee, tea, butter and baked goods. In the afternoon we took a tour of Dublin and found out that all of the sites we wanted to see were in walking distance from our hotel. 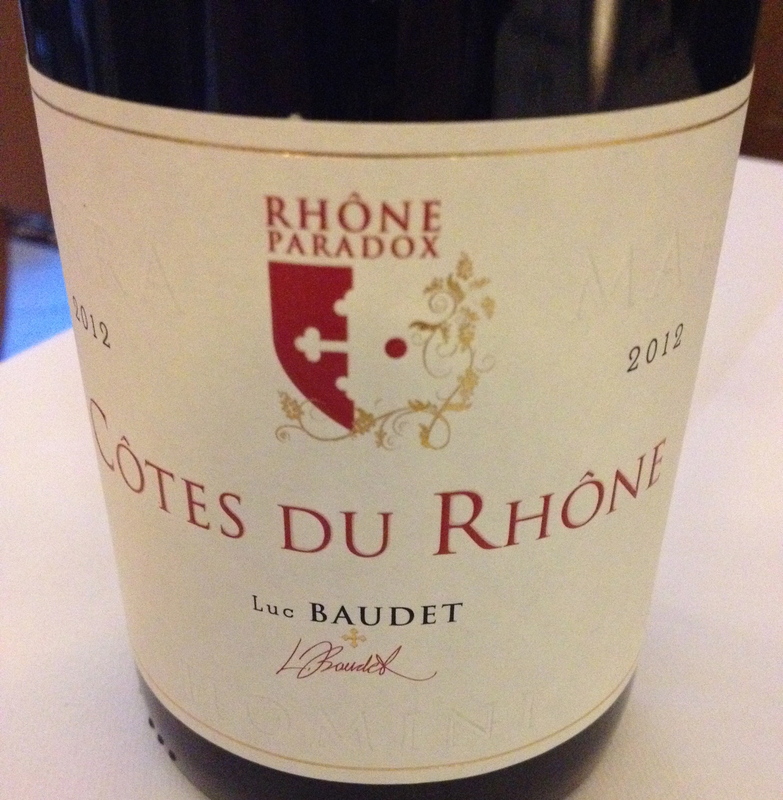 For dinner the first night we went to The Hot Stove Restaurant, 38 Parnell Square Dublin 1 where we had a very nice dinner and a bottle of Côtes du Rhône AOC “Rhone Paraodox” 2012 Made from 100% Grenache. Luc Baudet. The vines are located on the right bank of the Rhône. The soil is a combination of sand and smooth pebbles typical of the Villafranchian era. The wine is fermented in concrete vats. It has nice fruit aromas and flavors with hints of raspberries and spice and a long finish. 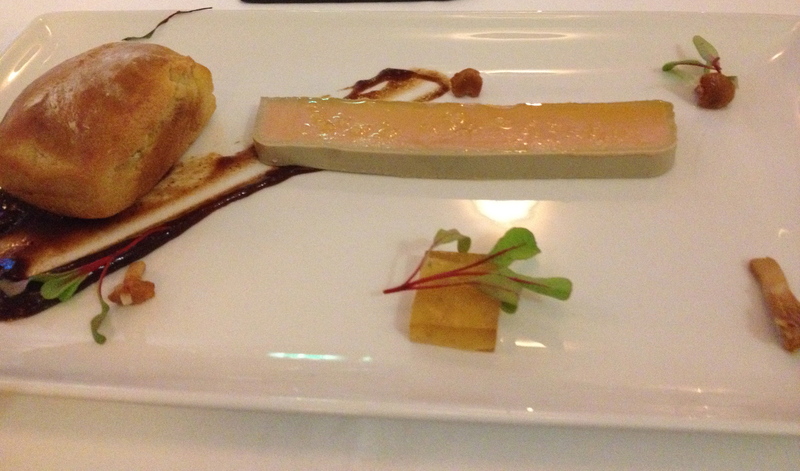 With the wine we enjoyed a chicken liver pate, stuffed quail and wild boar. The next afternoon we went for lunch at a restaurant called the Winding Stair which is upstairs from a bookstore. 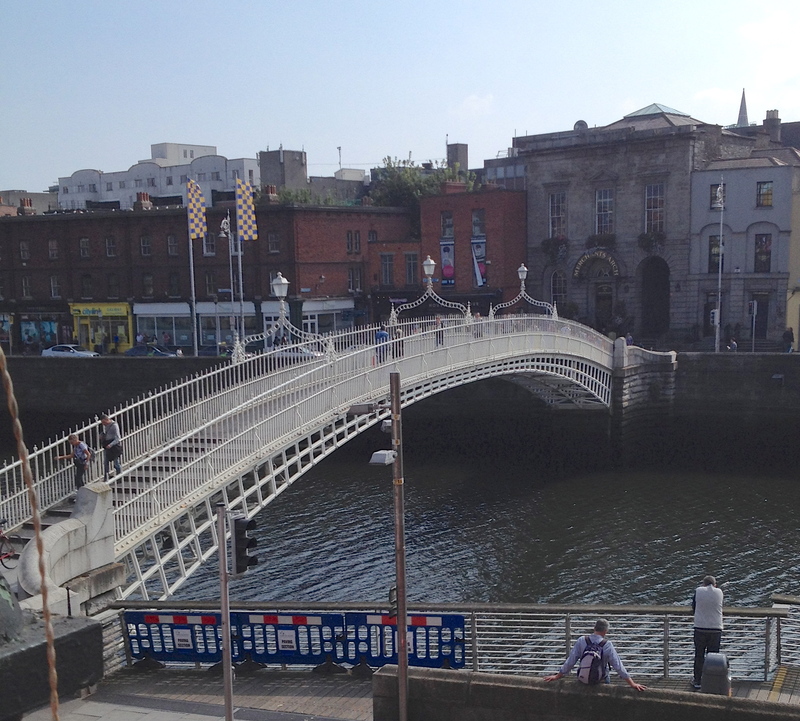 It was on the other side of the river and we crossed over the famous Penny Bridge. I ordered a half-pint of beer, The Porterhouse Oyster Stout, which the label said was brewed with oysters. I enjoyed it. 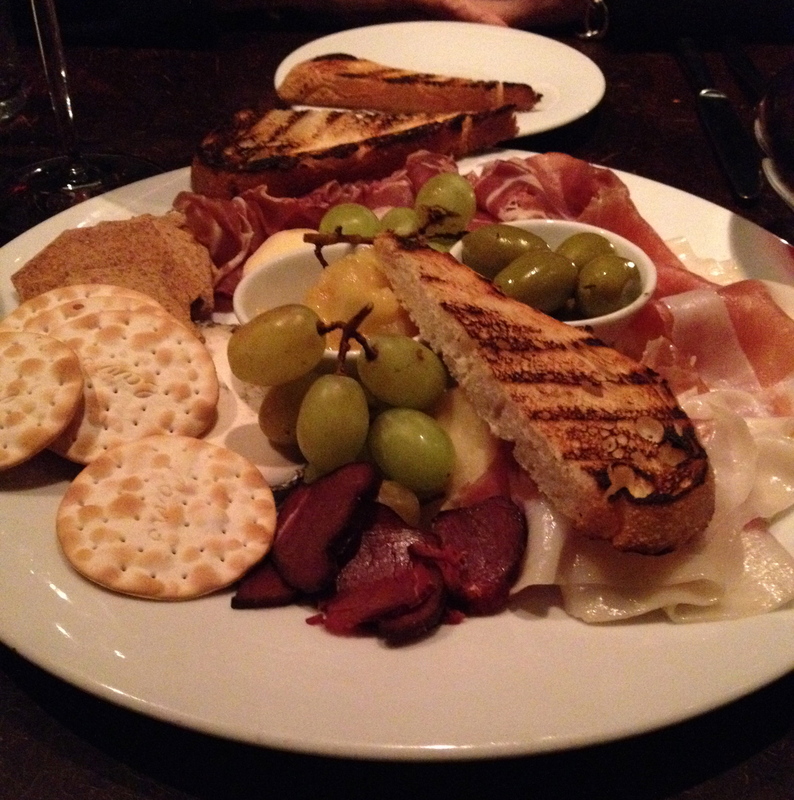 We also went to Ely Winebar, 22 Ely Place Dublin 2. We had a cheese and cold cut platter to start and hamburgers that were better than many that we have had in NYC. Great fries, too! 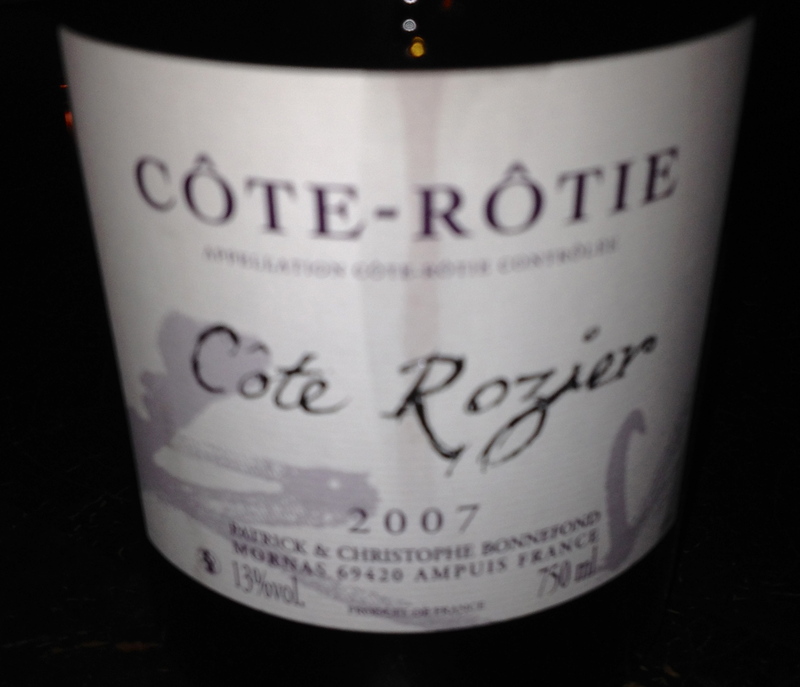 We drank a bottle of Cote Rotie “Cote Rozier” 2007 from Christopher Bonneford. Made from 100% Syrah. The soil is schist/mica and 1 hector is on loose granite and gneiss. The vines are 30 to 35 years old. Harvest takes place as late as possible and the whole crop is destemmed. Fermentation lasts for 25 days in stainless steel vats with remontage and pigeage. 90% of the wine is aged in French oak barrels (10% new) for 24 months. The wine is not filtered but there is a light egg white fining. This is a big, full-bodied wine that can age. It has hints of blackberries, licorice and smoke with a very long finish. For lunch the next day, we went to a pub called the Duke on Duke Street. 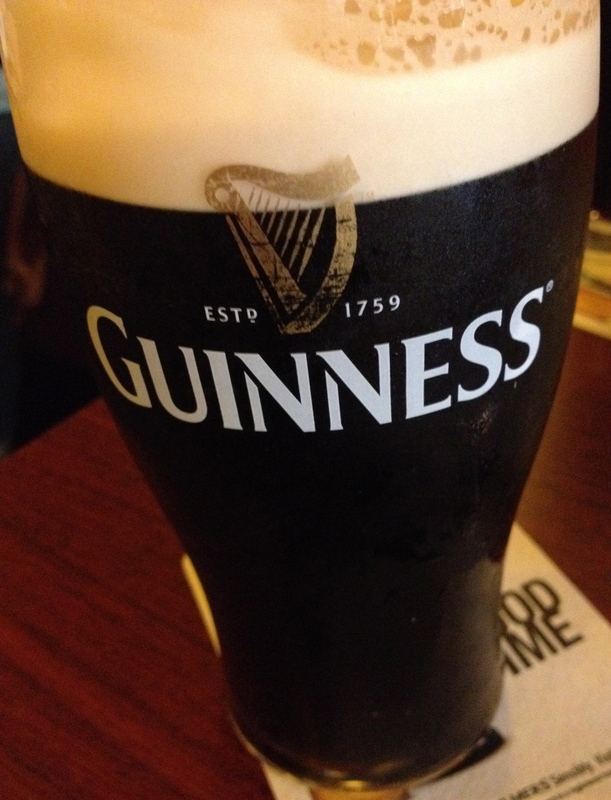 We had hot carved pork sandwiches and we just had to have a pint of Guinness. On FB I noticed that Marina, an Italian friend who lives in Milan, was going to be in Dublin at the same time. We made a date to meet for dinner. We went to Fallon and Byrne, 11-17 Exchange St. Dublin 2. They have a large noisy crowded winebar in the basement, a supermarket on the first floor and a nice restaurant on the second floor. Michele and Marina ordered fish and I ordered steak and chips. The chips, better known as French fries were excellent. 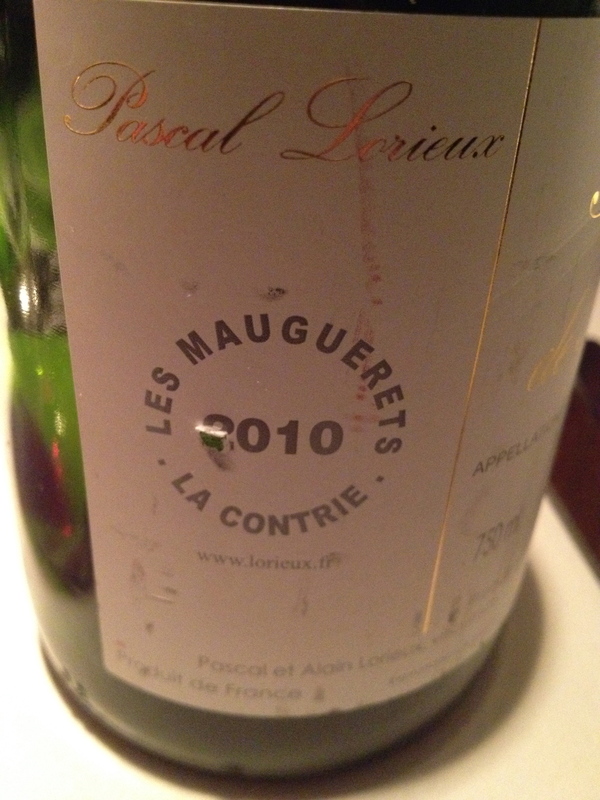 We drank a bottle of Les Mauguerets Lacomtrie St Nicholas de Bourgueil from Pascal Lorieux made from 100% Cabernet Franc. Harvest is in the beginning of October. Destemming takes place and then total maceration for 5/6 weeks with daily pumping over in stainless steel tanks. The wine went very nicely with the steak. Another night we went to Fade Street Social, 4/7 Fade Street Dublin 2. This was a large, busy restaurant with a great many choices on the menu, plus specials, plus 3 chalkboards. The chalkboards list different cuts of meat at different prices depending on the cut and the size. When one was ordered a waiter would climb up and cross it off the board. We had duck mousse, salad with bacon and 2 kinds of eggs, a pork chop and a cut of beef called the Butchers secret. 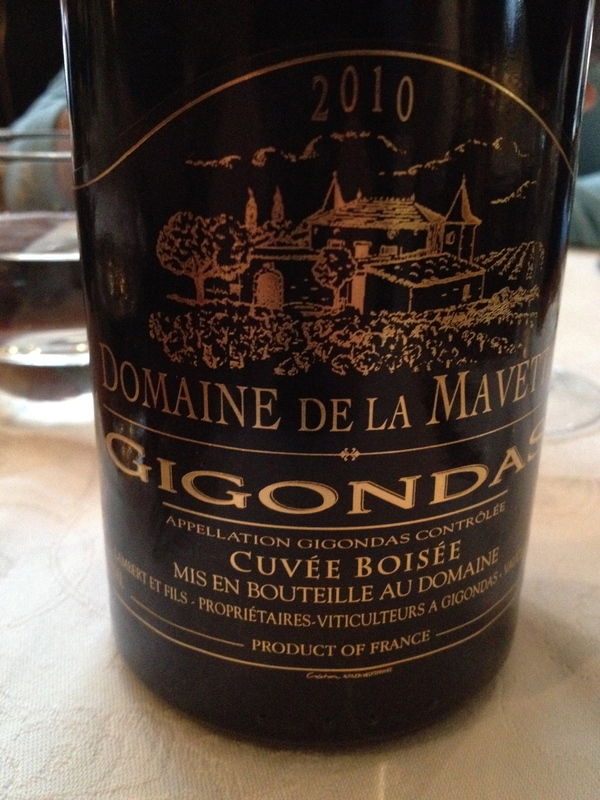 We drank a bottle of Gigondas “Cuvèe Boisee” 2010 from Domaine Mavette made from 65% Grenache, 25% Syrah 5% Mouvèdre and 5% Cinsault. The soil is clay and limestone and the exposure is south/southwest. The age of the vines is 5 to 60 years. Harvest is manual, and there is a sorting of the grapes. Traditional temperature controlled fermentation takes place with maceration for 20 to 30 days. All of the wine is aged in barrels for 18 to 20 months. The wine went very well with all of the meat. 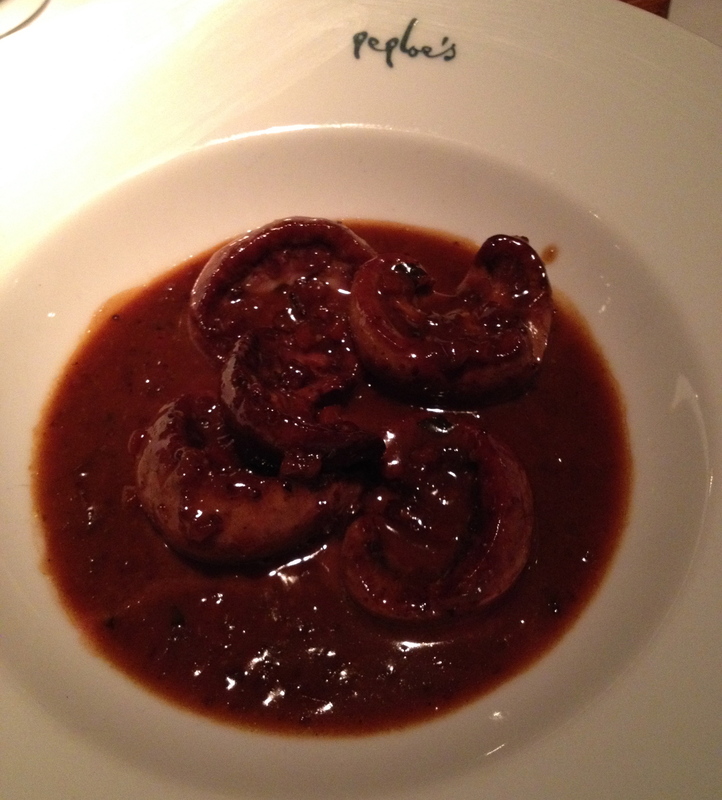 The last night went to Peploe’s at St. Stephens Green Dublin 2, a few blocks from the hotel. This is a very pleasant restaurant with excellent wine service and good food. 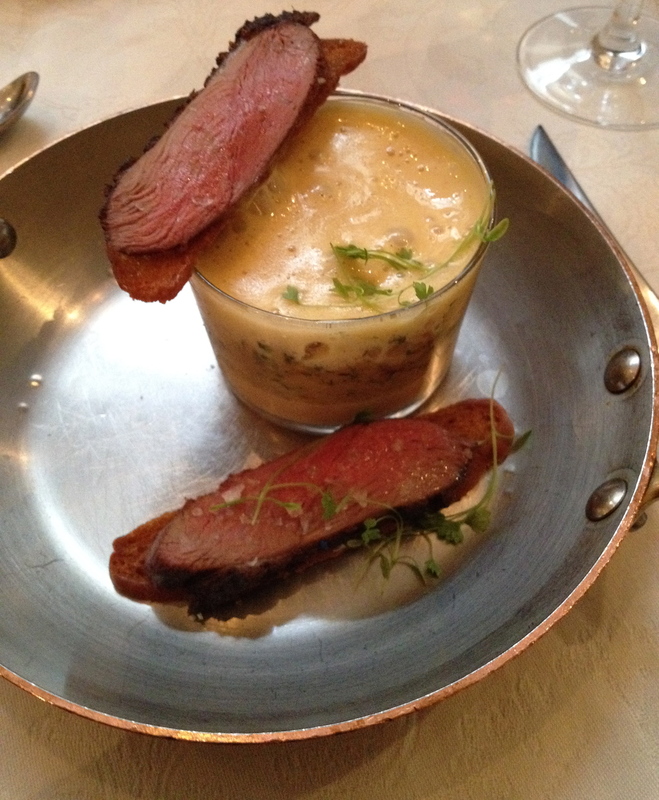 I had lamb kidneys in mustard sauce and roasted chicken with black truffles. 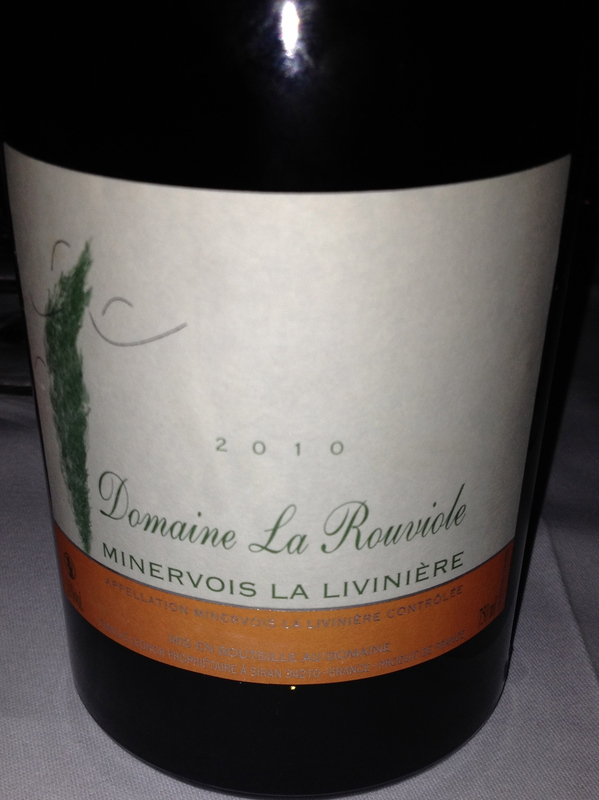 With the food I ordered a bottle of Minervois AOC 2010 Estate Rouviole in the Minervois La Livinière. Made from 80% Syrah and 20% Grenache. The soil is clay, limestone and sandstone. The vineyard has a southern exposure and is at 100/200 meters. Average age of the vines is 40 years. Two manual harvests take place at the end of September. There is de-stemming and traditional fermentation, which lasts for three weeks, in stainless steel tanks. The Syrah in aged in French, American and Eastern European oak barrels. The Grenache is aged in second passage oak barrels and in stainless steel to retain its finess and expression of red fruit. The wines are then blended. This wine was drinking very well and was a perfect combination with the kidneys and the chicken. NOTE – If you get to Dublin, do not miss seeing Trinity College which includes the Book of Kells and the long room in the Library. The Dublin Castle tour is great for a history of Dublin and Ireland. The Wild Wicklow Tour of the countryside was the best bus tour I have ever taken! Very Important Note: At Dublin airport after you clear Irish security, passengers going to the U.S. go to a separate part of the terminal where they pas through U.S. customs, so when you arrive in the US you just walk right out of the terminal! It made arriving back home so easy! So happy you enjoyed your trip to our Fair City! Ciao Dave, we had a wonderful time and the people could not have been nicer!